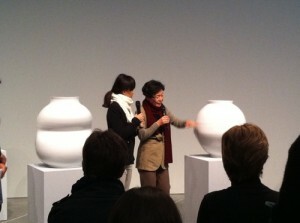 Yeesookyung’s Translated Vase – the Moon, 2012 and Park Young-Sook’s Moon Jar, 2012 stand facing each other in the MCA. 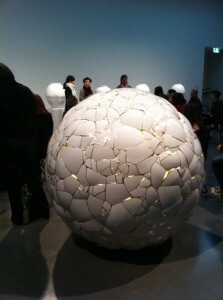 Yeesookyung’s work has been constructed from the exploded fragments of Young-Sooks porcelain moon vases. 24-carat gold leaf fills the cracks between these pieces of broken porcelain and highlights the process of recycling from master ceramicist Young-Sook. This “collaborative project between the two artists is about death and rebirth – something being re-formed into something new” (artwork information panel). Yeesookyung aims to mend these fragments of shattered vases with the 24-carat gold, transforming them back into something precious and whole. Young-Sook’s 12 moon jars represent the 12 months of the year and are all individually made pieces that have their own personality. She spoke at the MCA of the process of making these porcelain moon vases, which are made using traditional porcelain making techniques. These moon vases, created with what she describes as a Korean mannerism, are made from two separate pieces of thick clay that are then joined together. It takes 100 days to join these two separate pieces into one and is a slow process with many exploding in the kiln or simply not sticking together. Young-Sook uses what she describes as the extremely accessible medium of clay, and transforms this dirt into a beautiful piece of art. There are parallels between this and Yeesookyung’s works, as Yeesookyung transforms broken pieces of clay into her artwork. Young-Sook likens the clay in its early stages to an impressionable baby that can be shaped however she wishes. However, as it drys in a process that takes 15 days, it becomes a rebellious teenager, wanting to change its shape and reduces in size by 50% In order for the two separate pieces of clay to become a ‘married couple’ each piece must hold onto each other tightly. Many of the moon vases do not stick together and end up falling apart, which explains why there are many failures in this slow, expensive art making process. These moon vases draw the viewer softly into each of the works with the use of harmonious, white curves, which Young-Sook fills with different feelings. This entry was posted in Art and tagged art, MCA, women artists. Bookmark the permalink.